The Via Romana is the Roman Way of life. It is the direct application of Roman ethics, virtues, and philosophies in everyday life, and it is one of the the goals of NOVA ROMA to promote the Via Romana among its citizens. One of the cornerstones of the Via Romana are the Virtues; those qualities which define the ideal state of being and behavior of the Roman Citizen. While no one can ever completely and perfectly embody the Virtues, they remain as the goal towards which we strive, and serve as the benchmark against which we may measure ourselves. The Via Romana also includes the various philosophical schools that were active in the historical Roman Empire. Chief among these were the Stoics and the Epicureans, although various other, less well represented, schools existed as well. Roman philosophy provides what the Religio Romana does not (nor does it try to); a coherent moral code for personal behavior. Thus, while all of us are Citizens of NOVA ROMA, and most are practitioners of the Religio Romana to one or another extent, the choice of personal philosophy allows the individual to express his or her personal moral and cosmological inclinations within the larger framework of Roman society and religion. This separation of personal philosophy and religion is one of the most healthy aspects of the Religio Romana, and one of the reasons it is so uniquely suited for modern times. 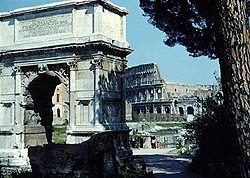 Finally, the Via Romana, in the modern context, refers to the general study and practice of Roman culture. As with all aspects of NOVA ROMA, the extent to which any given Citizen indulges in this area is up to his or her own inclination; but it is certainly encouraged. This includes the learning and use of the Latin language, the study and reenactment of Roman arts (including historical military reenactment), the production of Roman drama, the study of Roman history, and a wide variety of other pursuits. It is as part of the Via Romana that Citizens are expected to take up Roman names for use within our society. Similarly, each Citizen is considered to be a member of one of the gentes (families); new citizens may either be adopted by existing gentes or may form their own. As with all things that make up the Via Romana, the emphasis is on the practical application of these arts and this knowledge in our everyday lives. We study Rome because we seek to emulate Rome; we emulate Rome because we admire Rome. Ancient/Classical History: About.com -- Updated regularly, with an emphasis on items of interest to educators. Brief article on Roman Clothing. If you click on "home" you will go to an index of several short articles on aspects of Roman life. Armamentarium: A "virtual book" of Roman arms and armor but covers ONLY helmet, sword, dagger, and tents. The Atrium: A wealth of information, including "The Ancient World on Television This Week". Forum Romanum: A high-school student in Virginia has created an excellent virtual tour of ancient Rome. Diotima: Women and gender in the ancient world. Enigmatic Questions of Tiberius: This is actually a sampler page from the book On the Roman Religion by Horace W. LaBadie, Jr. (has a link to purchase the book) Includes very extensive information on Roman Religion. How did Roman fountains work? : From the How Stuff Works site, a helpful explanation of one of Rome's more practical achievements - its plumbing system. Includes links to related sites. Limesmusem Aalen, Germany: In German, of course. Roman Board Games and Roman Ball Games: Descriptions, history of games, game-related art and artifacts, and (where possible) rules for playing them yourself. Lacus Curtius: Bill Thayer's pages at the University of Kansas -- Over 1200 Internet sites having to do with anything Roman. Subscribe for updates. ROMARCH: Roman Art and Archeology. Note: There is a disclaimer at the top that the site is being revised. Site contains numerous dead links. SPQR Companion: Note that this page has a distracting background making it hard to read. Biblioteca Arcana: Articles on Greek and Roman religion with some neopagan emphasis. Cindy Renfrow's Links Page - Not specifically Roman but an INCREDIBLE resource. Internet Classics Archive: Over 400 classical Greek and Latin texts available--but none are easily downloadable. Perseus Project: a wealth of classics, but none of the easily downloadable. Has a wonderful reference/search feature for texts. On- Line Books Page: Lists 11,000+ books of all types. Search here first for any book in English. Most easily downloadable. The Latin Library: Books in Latin. All easily downloadable. The Detective and the Toga: concentrates on mystery novels. Roman-era Historical Fiction: A lengthy list of historical fiction set in ancient Rome. Karnak Search Engine: A "mole" or a "robot" search engine. You get one free research "shelf" -- you can pay big bucks for more. Type in a topic to research and you get weekly e-mail reports on the results of your search.